I came across this opinion piece I published in 2003 in Beverage Media’s Beverage Journals nationally. 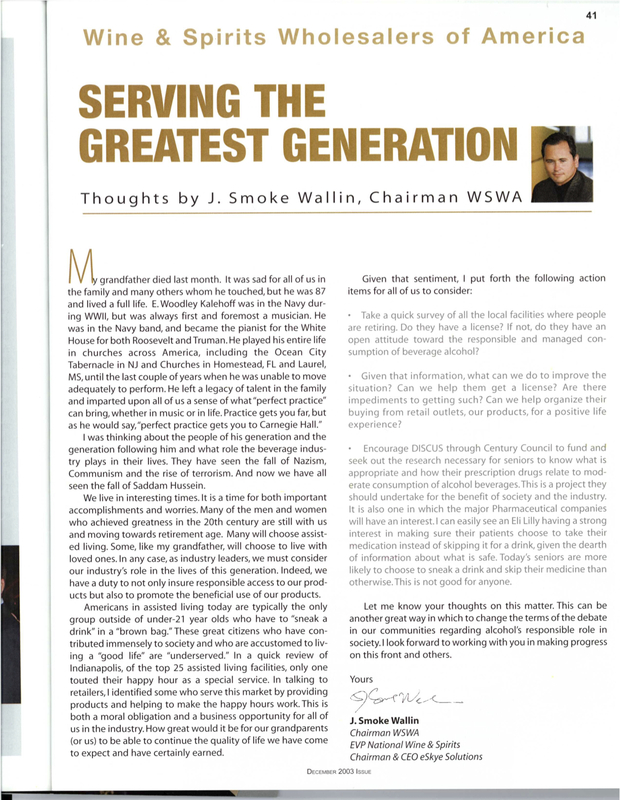 This was as my role as Chairman of the Wine & Spirits Wholesalers of America WSWA and was meant to spur debate. Thought I’d re-post. Let me know if you have thoughts. This is a very momentous moment… thanks to everyone who sacrificed over the past decade! I would like to especially recognize the US military, special forces and intelligence community and to all those many others who have sacrificed since that terrible day in 2001. Is anyone serious in Washington? Those of you who read my occasional posts know I don’t get into political rants on this blog. Whilst I do have strong opinions on the state of the world, our country and local communities, I generally don’t find it productive to get into shouting matches online. I’m primarily an entrepreneur and I do business with people all over the world with many political views. I don’t see politics as a screen for commerce. This country and indeed most successful countries are built on the backs of individuals who take risks and build businesses. I feel very patriotic when I start a new business and work to create value for shareholders, employees and customers. I don’t want the government to help me with my businesses, but I ABSOLUTELY don’t want them in the way either. Uncertainty on healthcare and tax policy has caused me to not hire several positions in the past months. I have instead paid outside firms to do some of the work that would be done by our own employees. I will continue on this path as long as possible. Alas, given the current state of the US Budget and the latest one submitted by the Obama Administration, and the general lack of what I would view as seriousness in Washington, I am moved to comment here. The long term government share of US GDP has now expanded to an unsustainable level and I see no willingness to deal with this by making hard choices. They call economics the “dismal science” for a reason. It is about trade offs and choices. One can’t have it all. Government cannot simply continue to take productive resources (private) and shift them to largely unproductive uses (government spending) and expect good results. GOVERNMENT is not the answer, it is a significant part of the problem. I was one of the independent minded libertarian leaning conservatives who was so upset with the growth in spending in the Bush Administration. But instead of correcting this course, President Obama and the Congress have actually made it much much worse. The trajectory is horrendous. How can anyone who is serious actually think it is okay to support such unsustainable spending and frankly a shift to the next generation of the responsibility to pay for it all. #LEADERSHIPNOT #FAIL. Wake up. The Republicans as a whole don’t “deserve” to be in leadership either based on their record over the past decade, they lost their way. Bush to his credit did TRY to make Social Security reform a major tenant at the beginning of term II, but he got stopped by his own party and then they started losing elections. He also did not seem to know how to veto anything and went along with the expansion of government, so he does not deserve any credit here. The White House’s 2011 budget is only the second-most interesting budget proposal released recently. First prize goes to Congressman Paul Ryan, the ranking Republican on the House Budget Committee, who’s released a budget proposal that actually erases the massive long-term deficit. So what gives… why haven’t we heard a lot more about this? why are the Republican leaders on the talk shows talking about this budget? Why don’t they get behind it? Are they? I say vote out anyone who does not actually work to fix this problem. Elect only those who actually commit to closing the gap. HERE IS THE PLATFORM: Shrink spending now, fix entitlements (Yes Medicare, Medicaid, Social Security at the Federal level and Public sector pensions at the State level), get government out of the way. If you want to “fix” healthcare, shift to a consumer oriented system where we have a direct connection to choices we make and what it costs us. On Entitlements: You don’t run away from this, actually stand up and run on it. Create a mandate. You don’t need to touch any entitlement that is already in action (ie if you are already retired), simply change the deal for all of us who are still working and phase it in. If you are 60, keep it as is. If you are 50, you can’t get benefits until 70 years old. If you are 40 or below, make it 75 and let us invest part of OUR money directly. Seriously, stop the madness. J. Smoke Wallin, Chairman of Wine 2.0, had the opportunity to interview filmmaker Carla De Luca Worfolk, Director, EP/Producer, and Writer of an amazing new wine film. Carla is an Emmy award-winning television and documentary producer. Her new DOCUMENTRY FILM ‘AMERICA’S WINE: THE LEGACY OF PROHIBITION’ is an amazing look at the history of the wine industry in America. I had the opportunity recently to ask Carla some questions about her experience making the film. Let us know your thoughts. Smoke: Carla, what inspired you to make “America’s Wine: The Legacy of Prohibition”? Carla: I had the opportunity to film the private luncheon celebrating the 70th Anniversary of Prohibition’s Repeal where a number of the venerable winemakers were honored. As several were in their 80s and 90s, I began thinking about their contributions and personal histories, and felt strongly that their story should be recorded before the passing of this generation. I also believed we should cover major policy issues which affect all consumers, such as direct shipping laws, health research, and the globalization of wine. Smoke: Can you tell us a little about your experience growing up in and around the wine industry? Carla: My father became President and CEO of the Wine Institute when I was about nine years old, which seemed very natural to me. Being part of a large Italian-American family, my parents and grandparents often had wine with their meals. The best part has always been meeting the people. I have very fond memories of visiting wine makers and their families, playing in the vineyards and sharing meals all through the years. Smoke: What was your biggest surprise while putting this project together? Carla: The biggest surprise was learning about how the boom in home winemaking in the early 20s created such an incredible demand for fresh grapes. I also marveled at all of the ingenious ways winemakers stayed in the business during Prohibition and recovered after Repeal. On a deeper level, these aspects really underlined for me the incredible optimism and determination of the wine makers and also immigrants who overcame great obstacles during that era, including Constitutional barriers. Smoke: Besides our interview, who was your favorite interview and why? Carla: Besides our interview, that’s truly a tough question. We interviewed remarkable people and had great experiences across the board. Because it was such a unique experience, our meeting with Brother Timothy has stayed especially vivid for me. He invited us to spend the day with him at his residence on Mont La Salle above Napa Valley. At age 93, he had difficulty walking, but he graciously hosted us all day, answering our questions and sharing other reflections with such brilliance and clarity. Over lunch we talked about everything from Prohibition to the Internet. He was an amazing individual. Smoke: It seems you had all tiers cooperate in the making the film, who did you want to get involved by would not and why? Carla: Actually, nearly everyone we asked for an interview accepted. A couple of people declined, mainly due to logistical reasons. We did hope to have a few critics of the wine industry, but in the end we felt very pleased that we had such credible credentialed people, and a number from outside the wine community, like Kevin Starr, Leon Panetta, Marion Nestle and Phil Lee, who gave us balanced comments. Smoke: The cast of characters who did interviews was amazing. A number of these industry titans are no longer with us. Can you comment on the timing of putting the film together as it relates to this? Carla: We really felt like time was of the essence, knowing that a number of the people we wanted to capture on camera were at an advanced age. Several had not been interviewed in their later years and some had never been interviewed on camera. Recognizing this was one of the driving forces of the documentary, impacting our research and how we managed our schedule. We are extremely fortunate we were able to record them when we did. Smoke: What can you tell the Wine 2.0 members “behind the scenes”? Any cool stories? Carla: There were a lot of memorable moments, from 95 year old Dan Turrentine serving us his favorite drink besides wine, Dr. Pepper, to Tom Shelton surprising us after the interview with a complimentary tasting of some of Joseph Phelps’s finest wines. We also were very lucky after a camera failure which obliterated most of Kevin Starr’s first interview. We caught the problem just as we were packing up to leave. He graciously cleared the rest of his afternoon schedule to redo the interview. He was equally, if not more brilliant, the second time. Smoke: I’m sure you had tough choices to make in putting the final cut together. What did not make the film? Carla: It truly wasn’t easy to make choices and it took several months. In the end, we couldn’t include everyone we interviewed in the final film, but all of the interviews will become part of the Bancroft Library’s California Wine Industry collection. Also, believe it or not, we actually collected more than 3,000 still images, but only used 300 images in the final cut. Smoke: What’s next for the film? Festivals? TV? Carla: We just had a great premiere evening at the Napa Sonoma Wine Country Film Festival at the end of September. We’ve also received terrific awards – the Gold Kahuna Award, which is the top prize in the Documentary Competition at the Honolulu International Film Festival, and the Silver Ace Award for Outstanding Filmmaking from the Las Vegas Film Festival. Currently we’re focussed on outlining an edited-for-television version for national broadcast, and I’m glad to say there is strong interest. We’ll be keeping everyone updated on this and future screenings through the Bancroft Library’s website. Carla De Luca Worfolk, an Emmy award-winning television and documentary producer, has enjoyed an extensive career across media, gravitating towards highly creative assignments with an emphasis on education, public service and policy. Throughout her career, the San Francisco Bay Area native has worked as an independent producer, magazine editor, writer, public relations executive, and paralegal. She holds a Bachelor of Arts degree with honors from Santa Clara University, and a Master of Journalism degree from the University of California at Berkeley. During her years as a CNN producer in Atlanta, Worfolk supervised content for the highly-rated CNN Saturday/Sunday Morning program, a live, two-hour magazine show, and was also on the Emmy-winning team that covered the Olympic Park Bombing in 1996. America’s Wine: The Legacy of Prohibition is her first independent film.